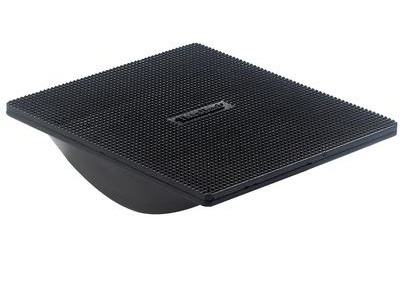 StrongBoard Balance Trainer is revolutionary balance board that improves balance, core strength, agility, and posture. StrongBoard Balance Trainer is a one-of-a-kind, premiere balance platform for all levels of fitness enthusiasts. As a portable and electricity-free platform, it allows users to train using their own body weight for resistance during full-motion exercises. Its platform rests upon four compression springs, allowing individuals to train using their own body weight for resistance during full-motion exercises. The primary function of the StrongBoard Balance Trainer is to strengthen the stabilizing muscles. Simply standing on StrongBoard Balance Trainer provides a complete core workout. When performing basic exercises, such as squats or curls, StrongBoard Balance Trainer users experience real results much faster than traditional core workouts targeting the same muscle groups. StrongBoard Balance Trainer delivers profound results to all levels of fitness enthusiasts, creating desired changes in how they look and feel and improvement in balance, core strength, agility, and posture. 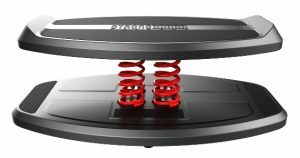 StrongBoard Balance Trainer is available in 5 standard spring colors: Red, Blue, Black, Yellow, White and Orange..
StrongBoard Balance has 4 individual compression springs situated between a base and a platform. 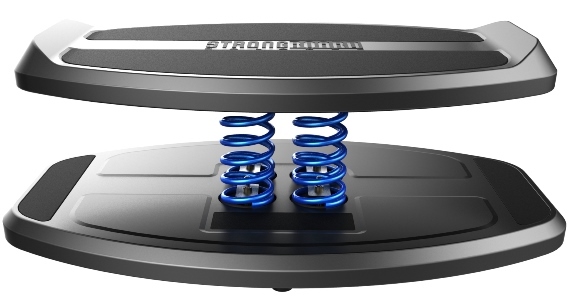 The unique affect of StrongBoard Balance is how the springs work once weight is applied. When a user stands on the board, the springs compress. The user’s body instantly searches for stabilization. 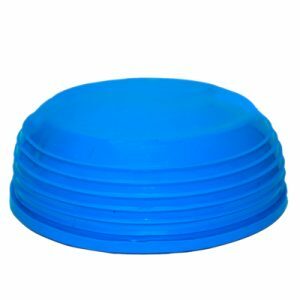 Because of the force applied to the springs from the user’s body weight, StrongBoard Balance will not allow stabilization to occur. Every muscle contracts in search of the stability it is used to on solid ground. As long as the user is on the board, compression in the springs will keep muscles in contraction the entire time. StrongBoard Balance offers multiple options for users. Its primary function is to strengthen the stabilizing muscles. Simply standing and holding one’s balance provides a complete core workout. When performing basic exercises on StrongBoard Balance, such as squats or curls, users experience real results much faster than traditional core workouts targeting the same muscle groups. For an effective and efficient upper body workout, StrongBoard Balance strengthens and tones the user’s arms, chest, and back when used as a push up device. Virtually any floor exercise may be conducted on a StrongBoard Balance for expedited strength and stamina. Skilled users may incorporate more advanced techniques, such as dual motion plyometrics. This promotes active muscle contraction producing even more intense and rapid results. Paired with a licensed physical therapist, StrongBoard Balance aids in the recovery of many injuries created by imbalance by gently increasing the patient’s flexibility, range of motion, and strength. Over time and with repeated use, exercising with StrongBoard Balance helps rebuild the bridge between the brain and the injured muscle. As users regain strength and decrease the pain associated with the injury, their range of motion increases, allowing for increased blood flow and further healing. 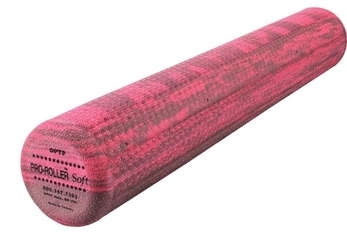 Provides a complete core workout.